Super Hero Boy: Connor loves going to the zoo! Connor loves going to the zoo! We go to our local zoo pretty often and Connor always gets worked up after a visit. Though lately I've been so busy with school and work that I've not really had time to take him, though he asks pretty regularly. Except now we can visit with some of our favorite zoo animals right from the living room! Baby Einstein's World Animal Adventure brings some of the coolest exotic animals right into your living room and combines the experience with Baby Einstein's fabulous music. Unlike seeing the animals at the zoo the World Animal Adventure shows the animals we love so much in their natural habitats! There is also two different versions of the show included on the dvd so the dvd actually grows with your child as they get older. I knew it was a success when I put the dvd on and Connor couldn't budge all the while giving me a play by play of each of the animals on the dvd, at least the ones he knew! Connor especially loves the puppets as well. 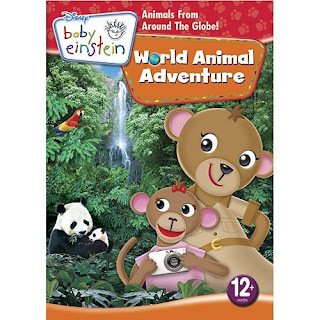 You can check out the Baby Einstein website to see a preview of the World Animal Adventure dvd as well as pick up your own copy!